OK, “saved the lives” might be a bit of an exaggeration, but when I was out for a run today, two little black pugs did appear out of nowhere and ran into traffic in a busy street. Thankfully, the driver of the truck they ran in front of saw them and was able to stop safely, and then he started honking, which caused one pug to run back to the sidewalk, but the other pug just sat their starting stupidly up at the truck. So I called the little guy over and after some consideration, he decided he would come over to me on the sidewalk. Not the actual pug. But this was pretty much the look the pug was giving the truck that was honking at it. Consider this a re-enactment. 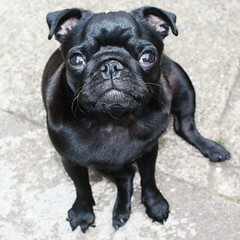 Except that I got this photo from Flickr and it was taken before today’s pug incident. Consider this a pre-enactment. Then I heard a man calling from across the street. He’d pulled his car over and was yelling something I couldn’t make out and pointing up the street. I looked to where he was pointing and didn’t see anything at first, but then I saw two little girls running out of their yard and as soon as the pugs saw them, they ran along the sidewalk to the girls, so I figured my pug-responsibility had been fully discharged and I turned back to my run. The little girls screamed “thank you!! !” to me and I was all “You’re welcome” and everyone was happy as a clam. In related news, getting back into running after so much not running – and while carrying around extra weight – has been challenging. My pace is so much slower than I want it to be, but I keep reminding myself that the only way to make it not so challenging and to make my pace better is to keep at it1. I’ve completed the first 5 weeks of my 17-week half marathon training and have managed to complete all of the Sunday long runs, and a few of the weekly short runs. I’ve also done some bike rides instead of some of the weekday runs because I freaking love my bike. Next week Alicia and I are planning to do the long run – 10 km to be exact – together. Because runs that are 1 hr+ are so much more fun to do with friends! With any luck, we won’t have to rescue any pugs on that run. Image Credit: Pug pic posted by moncho71 on Flickr.